The Irish Fiscal Advisory Council is an independent statutory body whose purpose is to provide an independent assessment of official budgetary forecasts and proposed fiscal policy objectives. It comprises five Council members and a Secretariat of seven. The Council was established on an interim basis in July 2011 and put on a statutory footing in December 2012 by the Fiscal Responsibility Act. The Act established the Irish Fiscal Advisory Council as a statutory body and legislated for the implementation of national and EU fiscal rules. The introduction of the Act was part of a wider agenda of budgetary reform, benchmarked under the Programme for Government 2011 and the EU/IMF Programme of Financial Support for Ireland. Further EU regulations (July 2013) resulted in the Council being assigned the role of the independent body that would endorse the macroeconomic forecasts produced by the Department of Finance on which Budgets and Stability Programmes are based (implemented by Ministers and Secretaries Amendment Act 2013). The process of this additional function is outlined in the Memorandum of Understanding) between the Council and the Department of Finance. To endorse, as we consider appropriate, the macroeconomic forecasts prepared by the Department of Finance on which the Budget and Stability Programme Update are based. To assess the official forecasts produced by the Department of Finance. These are the macroeconomic and budgetary forecasts published by the Department twice a year—in the Stability Programme Update in the spring and in the Budget in the autumn. To assess whether the fiscal stance of the Government is conducive to prudent economic and budgetary management, with reference to the EU Stability and Growth Pact (SGP). The SGP is a rule-based framework that aims to coordinate national fiscal policies in the economic and monetary union. To monitor and assess compliance with the budgetary rule as set out in the Fiscal Responsibility Act. The budgetary rule requires that the Government’s budget is in surplus or in balance, or is moving at a satisfactory pace towards that position. In relation to the budgetary rule, to assess whether any non-compliance is a result of “exceptional circumstances”. This could mean a severe economic downturn and/or an unusual event outside the control of Government which may have a major impact on the budgetary position. The Acts ensure the independence of the Council in the operation of its functions. The Council produces biannual Fiscal Assessment Report, as well as an annual Pre-Budget Statement. Reports are submitted to the Minister for Finance and published within ten days. 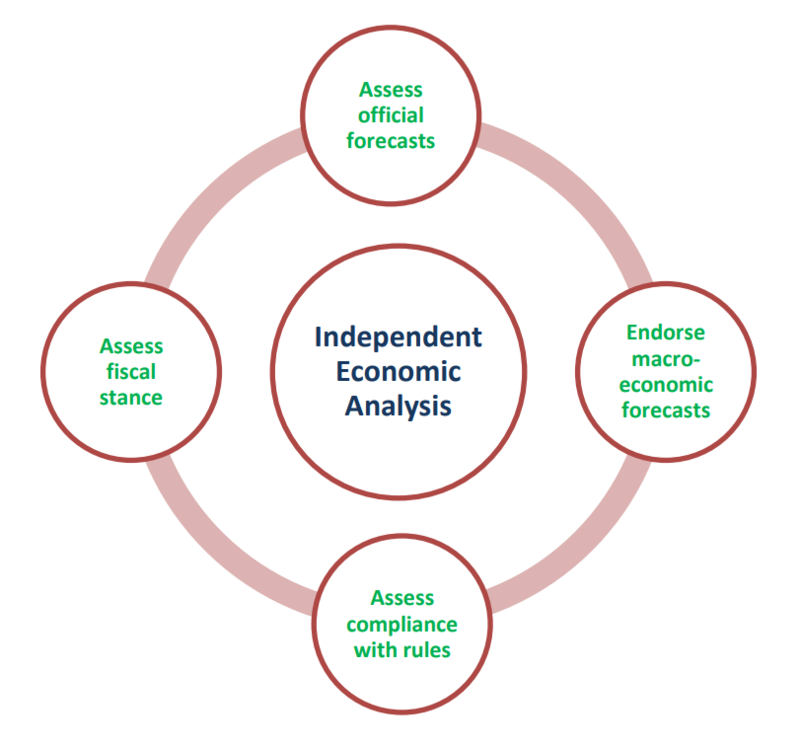 To support the Council’s delivery of its mandate, the Council also produces ad hoc reports including Analytical Notes, Working Papers and other analytical work on the Irish economy, macroeconomic forecasting, and fiscal policy, in addition to an annual Ex-Post Assessment of Compliance with the Domestic Budgetary Rule. —paper by Lars Calmfors, Stockholm University and Swedish Fiscal Policy Council and Simon Wren-Lewis, Oxford University. The Office for Budget Responsibility: can we make a difference? —Robert Chote, Chairman, Office for Budget Responsibility. Ken Dixon Lecture, University of York, 13 June 2011.